Have you ever thought why technology has become so important today? Simply look around and you will know why. The knowledge bust has fueled the information fire. Over the years there has been a drastic change in the technological world. Technology runs in our lives nowadays as we can’t live without tablets, computers, smartphones and other gizmos. You are surrounded by technology 24*7. 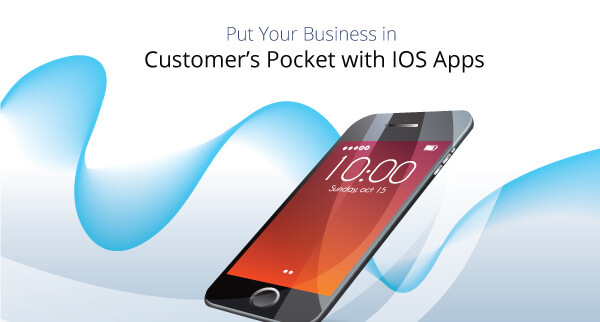 Keep your business ticking over wherever you are with an iPhone app. In this competitive landscape, it is important for the business owners or entrepreneurs to stay connected to the customers. iPhone has become a heartthrob of millions and majority of the audience owns an Apple smartphone. Over the years, the iPhone app market has gained popularity and business owners are investing in the industry for this reason. High revenue, better ROIs, increased users and wide market reach are some of the major benefits of investing in the iPhone app development strategy. Development of iPhone app has become the need of the hour. With over 2.2 million apps in the iOS app industry, there has been a cut-throat competition that sustains. Most entrepreneurs and business owners are not that technically sound and for this reason, they hire iOS app developers. They ensure your requirements are fulfilled. Make sure not to rely on a random iOS app developer and not blindly trust any. Look for a trustworthy company that guarantees quality app that delivers within the given time frame. You are likely to lose potential revenue if hire an inexperienced developer. Why hiring a reliable developer to counter the copious competition in the IOS app industry is important? If you wish to do something out of the box, it is important to hire a good app development company. Get quality development from experts and that too within the budget and time constraints. To achieve a positive outcome in the form of ROI, investment in the app is important. Make your app a success by incorporating unique and user-friendly features in your app with the help of the app development team that possess innovative technical skills. They take time to listen to the client, take their suggestions and then integrate the system as well as the workflow. To develop a mobile-friendly app, it is important to have a good API (Application Programming Interface), especially for a better user experience. To compete in this cutthroat scenario, you need expert skills. When things are not handled with care, it may result in the loss of your iPhone all development investment. Keenly observe your competitors and understand why strategies they are incorporating in order to reach the pinnacle of success. Quality assurance and Building powerful strategies are important to market products at a faster rate while combating errors. Dedicated developers cater to an agile approach to optimize testing as well as development cycle. Before doing the R&D it is important to ask yourself a few questions. Is it necessary to build a mobile app for your business? Do you have any plans of grabbing new customers? Are your potential customers happy? Do you understand user preference? Do you completely trust the app development company? Prior conducting the search it is important for you to ask yourself the aforementioned questions. The preparation step involves doing homework before the actual development takes place. Once you are done with the R&D, jot down what you want from the app developer. Create a checklist of your requirements and how things should flow. This will help developers understand your ideas and business requirements and it becomes easy for them to fulfil the technical specifications. In addition to this, you can also ask their strategy based on your business goals, user feedback, and market trend. High user engagement is experienced when the audience connects. Make sure you are getting the impressive UX designs and there is a customer-centric approach that is being followed. Also, optimization and performance enhancement is a must. How many successful projects have you delivered? What different strategy did you follow during the process? How many developers work together as a team? Did you ever exceed the deadline? How long does it take to complete one project? Can you share your portfolio? What is programming language used? A good app development company will resolve your queries and answer all your questions. In today’s business world where every company is living a tough competition to its competitor, it is important to put your business in customer’s pocket by developing an app. Although there are millions of apps available in the app store, you have to go an extra mile to deliver something to the audience that will astonish them.